This superbly illuminated frontispiece is decorated in white ink on gold ground, framed in gold with a stamped blue border. It contains the heading and initial verses of the first chapter of the Qur'an. The decoration, as is always the case with the Qur'an, is non-figural, relying instead on brilliantly colored and gilded geometrical and vegetal designs. The Arabic text is written in black ink, small florets marking the end of each short verse. 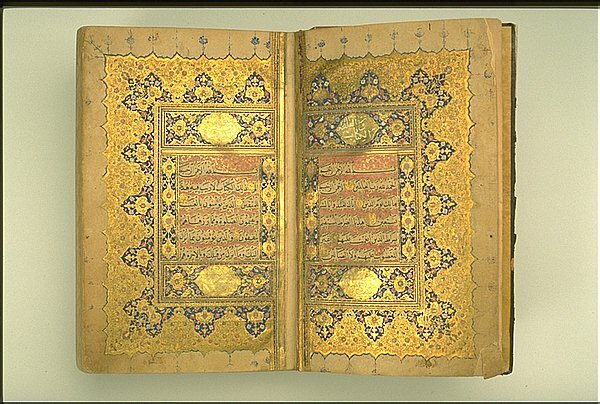 Because the Qur'an is seen as containing the unchanging word of God, the style and technique of writing and decorating copies of the text remains remarkably conservative through time.